In automotive terms, the Aston Martin DB5 was a blue-blooded aristocrat! The member of society's upper tier with whom the car is most associated is, of course, James Bond. 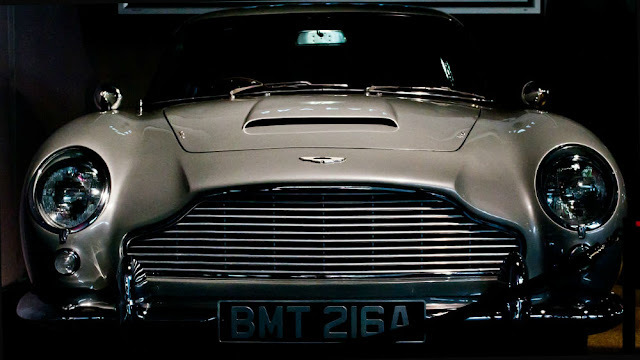 The DB5 played a starring rôle in Goldfinger. Indeed, it was unthinkable, back then, that '007' would have driven any other car! And, when Bond was recuperating in the country - from the rigours of defending the Western world - he no doubt found himself behind the wheel of a 'shooting-brake' DB5. Just twelve of these rarefied estate cars were built ... now, that is exclusivity, Miss Moneypenny! At the heart of the Aston's allure was its beautiful bodywork. Alloy panels came courtesy of Touring - the illustrious Italian design house. A network of minimalist tubing made up a skeletal frame - upon which was laid the car's finely-chiselled 'skin'. Flared-in headlights were a fashionable feature - and did no harm to the car's aerodynamics. Though it is uncertain whether Aston's test drivers could tell the difference - as they hurtled up the unrestricted M1 of the time. In that respect, at least, Aston's Newport Pagnell HQ was ideally situated. It is not every manufacturer that has its own test-track. A top speed of 140mph said it all! And if you wanted an extra 10mph on top of that - purely, in the pursuit of a round figure - a tuned Vantage engine was available as an option. The 4/5-speed ZF transmission was eminently tractable. If not quite cutting edge, the DB5's spec, as a whole, was at the high end of automotive development. With good reason, solid disc brakes were fitted all round! Ultimately, though, the DB5 was not about pushing the technical envelope. Rather, it built upon decades of impeccably-wrought craftsmanship. In so doing, it stood out, as a suave and sophisticated product. For a start, it had 'licensed to kill' looks! And its 4-litre straight-six engine - with 282bhp on tap - had performance to match. Arguably, David Brown's finest hour, his firm's reputation soared to new heights. After all, the Aston Martin DB5 was James Bond's personal transport. It does not get better than that!